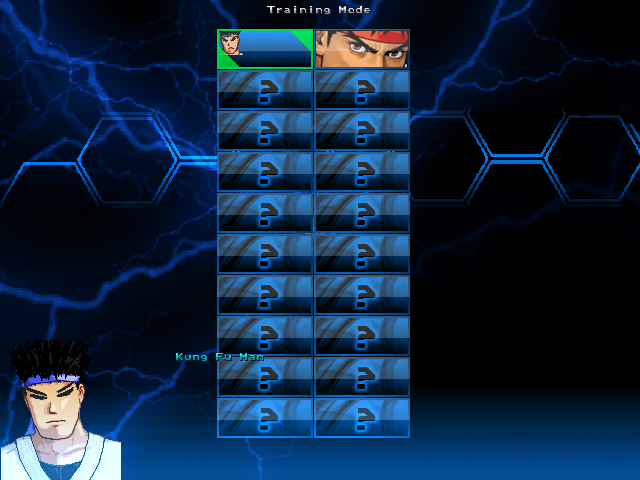 Let's try this again....NEWAGE MUGEN SP!!! GET HYPE!! » Projects » Let's try this again....NEWAGE MUGEN SP!!! GET HYPE!! Well, as mentioned above, the only completed part of the screenpack is the Select screen. Nothing more. There are no sprites for anything else that I posses at the moment. So i'd really appreciate anything you guys could supply, or any insights on how to code these things. Since, well, this is my first time doing such a thing. 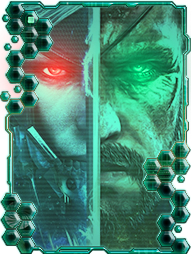 I will post a screenshot of the Select screen later, since I don't have access to it at the moment. I'd just like to see some usuable graphics, some testers, some insight, some advice, or anything you can dish out for me. Nice cant wait to see what you have and i dont mind giving some ideas since i dont have any thing that i actually feel like working on at the moment. I had like 2 unfinished screenpacks. I really need to finish them though. That is all that is done at the moment. I still have to add sound, work on the title, option etc. If anyone could let me know what would be an appropriate way to go about next, that'd be wonderful. Hey, man. It's not my fault he quit last time. I plan on finishing this, now. NO MATTER HOW LONG IT TAKES! Let see whats animated so far in the select screen? The hexagons are animated, the strands of what looks to be lightining are animated. I need some anim ideas for everything else, though. I'm a bit lost in that. Pretty much "Newage Mugen SP" sums it up. I'd prefer Newage Mugen artwork and such. Also, Gun0 can you elaborate on what that is? Yeah, I remember this one. I was sent some of the early ideas but, when things had changed and folks left. I lost motivation to work on it, because of no help or communications. I remember having some basic ideas for this one. I must research on some of my disc's and see if, I still have some concept's for it. If not, I will make something else. This is the concept we need to exercise to work. I have some sprites, that I might try to implement. But at this point, they aren't the greatest. Still, I'll try it, and keep everyone posted. Thanks, guys! I appreciate anything you can help me with. Good to see that this project's back! If you guys need anything, I'm open! Credits to ayumifan-S for the sig! Sal if you could help in annnnnnnnnny area you're good at, i'd appreciate any help I could get. I know I haven't posted much, i've been slowly trying to figure out the process of making screenpacks. Thanks, guys. Also, if ya'll could pitch out some ideas about the menu screen, options screen design i'll try my best to implement it. I'm just drawing blanks atm. And since it's a forum SP, i'd like you to all have a say on what you'd like. I'm good at Lifebar GFX. That's what I do all the time. :P I could dish out some lifebars but I need to know the basic style of the screenpack. But I can base it off the screen you have in the first page. Also, is this for 1.0 or winmugen? On the main menu. you could go for a style similiar to NewAge's Forum page. OR you could go for something more hexagonal and futuristic. Thanks for the ideas. I'd greatly appreciate lifebars. I plan on making a winmugen plus and 1.0 version. I need more knowledge on how to do so, though. Update. I need insight, badly. The name placement bugs me, and I have no clue what to do for that. Its looking good GLB make some type a border around where it says training mode. 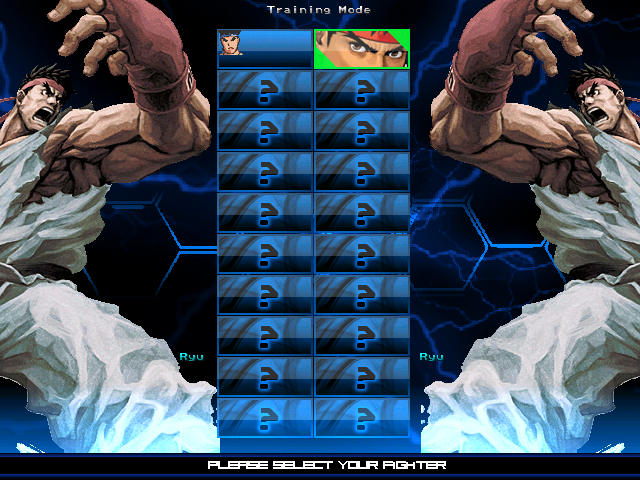 I've been trying with borders for the names and training mode already, but i'm having a bit of trouble. Thanks again for the ideas. Send the wip of what you have so far. i could not find the one quick gave to me. It might be on the old pc, I once had. Sure thing. I'll pm it to you right now. Beware, it's sort of clusterfucky, lol. Hey GLB im done with mugen but if you still need help on the screenpack i have time to help you out just send me the screenpack and what you would like me to do. Also if you dont mind can you delete my breaking point screenpack post that i made im not working on that no more. 26 Re: Let's try this again....NEWAGE MUGEN SP!!! GET HYPE! !